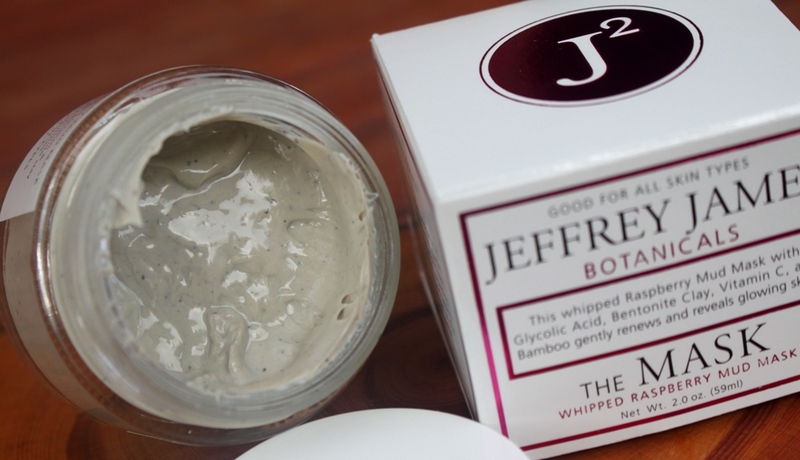 Jeffrey James Botanicals The Mask claims to be a decadent raspberry soufflé mousse that combines both an exfoliant and a clay mask for one simple, gentle approach to purely radiant skin. We use a blend of Organic Horsetail, Gotu Kola, Dandelion, Geranium, Verbascum Thapsus (Mullein), Calendula and Licorice. Each have amazing properties from centuries of healing properties to high concentrations of silica, anti-oxidants and skin food. Confirming the response from Jeffrey James Botanicals, Horsetail is a plant extract that has antioxidant and skin-soothing properties; Topical application of Gotu Kola has been shown to have healing and anti-inflammatory effects which can lead to the fading of acne scars; Dandelion extract has antioxidant and anti-irritant properties to soothe skin ailments, clarify the skin and reduce acne; Mullein has softening and soothing effects; Calendula is also naturally high in antioxidants and additionally provides a mild exfoliation to brighten and lighten surface pigmentation; and finally Licorice is anti-inflammatory and an effective treatment for eczema while also contributing brightening effects. Aloe Vera can soothe skin and serves as an anti-inflammatory and moisturiser. It complements the more aggressive nature of clay and Alpha Hydroxy Acids (AHAs). Glycolic Acid is said to be present at a concentration of 6.5%, surely significant enough to deliver the benefits of exfoliation and accelerated cell renewal for a more youthful looking complexion. Glycolic acid is naturally present in Sugar Cane which is also included in the formula. Lactic Acid on the other hand can gently break down the bonds between epidermal cells to clear the skin’s surface of debris whilst also working deeper to increase cellular turnover for smoother and more even skin tone. Hibiscus is another natural AHA that contributes gentle exfoliation as well as offering antioxidant advantages, helping protect skin from environmental stressors. Furthermore, a high mucilage content (a gelatinous substance that contains protein and polysaccharides) makes it a great moisturizer too. Alpha Lipoic Acid is a natural substance that also has the ability to smooth skin by increasing its exfoliating capacity. In addition it is a potent antioxidant that helps regulate oil production and reduce the effects of ageing. Meanwhile, included for its ability to detoxify pores is Kaolin Clay. It displays excellent absorption capability able to draw out impurities, excess oil and dirt to achieve clear skin. There are also brightening agents in the formula. Sodium Ascorbyl Phosphate is a stable Vitamin C derivative. A powerful antioxidant and anti-ageing ingredient, it is helpful for treating acne, protecting the skin against oxidative stress, promoting skin development through collagen stimulation and tone brightening. Licorice contains a phytoestrogen called Glabridin, thought to encourage the skin to create its own strengthening connective tissues resulting in anti-ageing effects. By inhibiting Tyrosinase, the enzyme responsible for the pigment of our skin, it also causes a lightening effect. Antioxidants are well represented in this formula with an array of botanicals including Phytic Acid and Tocopheryl (Vitamin E). Bamboo and Raspberry Fibres also boast moisturising properties. The former additionally accelerates the healing process of damaged skin due to the powerful anti-inflammatory methanol. Co-Enzyme, CoQ10 (Ubiquinone) is naturally found in our bodies. Together with the polyphenols in Green Tea, they boost skin repair and regeneration, plump skin and improve wrinkle appearance and radiance. A host of natural oils are included for their ability to moisturise the skin without clogging pores or leaving a greasy residue. They exhibit an ability to regulate excess oil production as well as deliver antioxidant properties to protect skin from free radicals. These include Jojoba Oil which is actually composed of 97% wax esters and mimics human sebum for better absorption. Naturally rich in Vitamin A plus essential fatty acids, it can also help to repair and regenerate skin cells. Squalane helps to hydrate, plump and soften skin and together with its antibacterial nature, is useful for treating conditions such as eczema and psoriasis. Coconut Oil is great for barrier strengthening due to its high concentration of saturated fats. 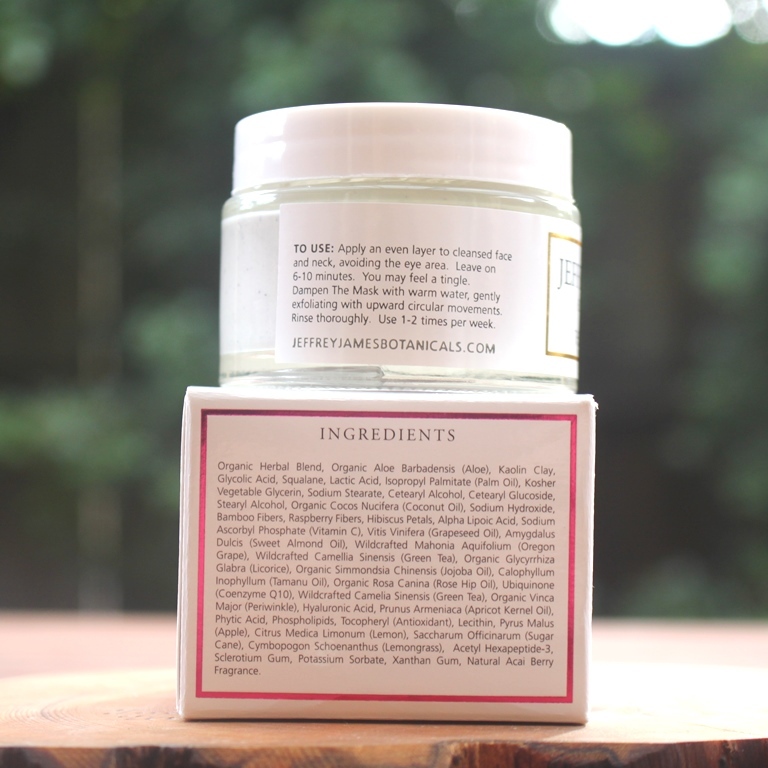 It’s antimicrobial and soothing, helping to speed up the skin’s natural healing process. Grape Seed, Tamanu, Rosehip and Sweet Almond Oils are rich in fatty acids. As well as being strong moisturisers, antiseptic qualities help to nourish and repair skin making them great acne treatments. Some significant players round off the formulation. Oregon Grape is good for treating bacterial infections and can also help to reduce and prevent acne. Fatty acid content and hence skin barrier strengthening is enhanced by the presence of Cetearyl Alcohol, Stearyl Alcohol and Phospholipids in the mask. Lemon and Lemongrass essential oils are added for their astringent, antiseptic and cleansing properties. There are also some hydrating agents included to balance the formula and ensure the skin retains moisture. Hyaluronic Acid has strong water binding properties that allow it to fill spaces between connective skin fibres known as collagen and elastin for a plumping effect. Vegetable Glycerin is an organic compound derived from plant seeds which helps to maintain water balance, promote cell growth and improve the overall appearance of skin. 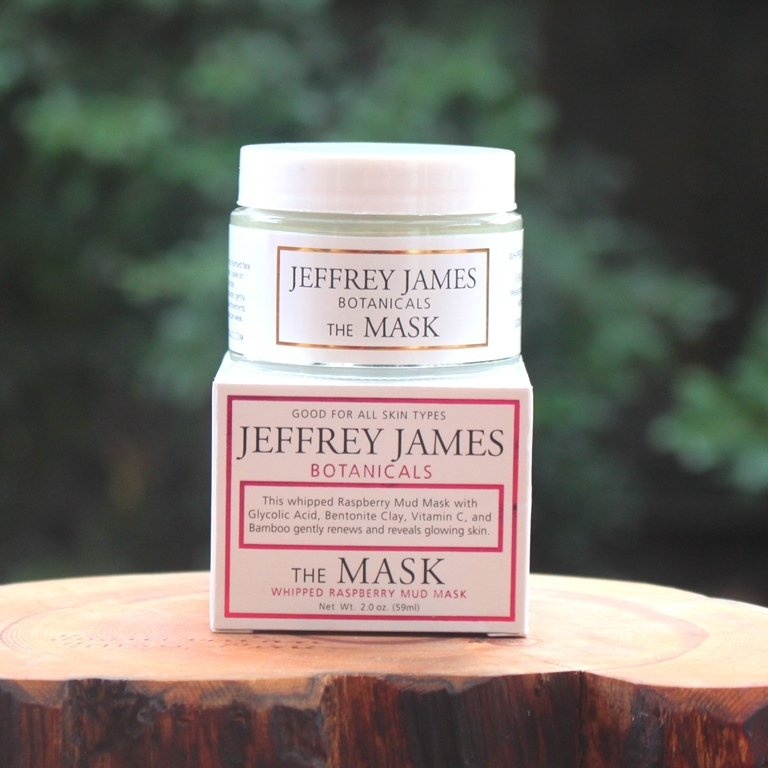 Jeffrey James Botanicals The Mask is presented in a glass jar with plastic screw top. Both the CosDNA and EWG assessments deem Jeffrey James Botanicals The Mask a moderate hazard due primarily to the presence of AHAs. Apply an even layer to cleansed face and neck, avoiding the eye area. Leave on 6-10 minutes. You may feel a tingle. Dampen with warm water, gently exfoliating with upward circular movements. Rinse thoroughly. Use 1-2 times per week. Jeffrey James Botanicals The Mask has a sweet berry scent. 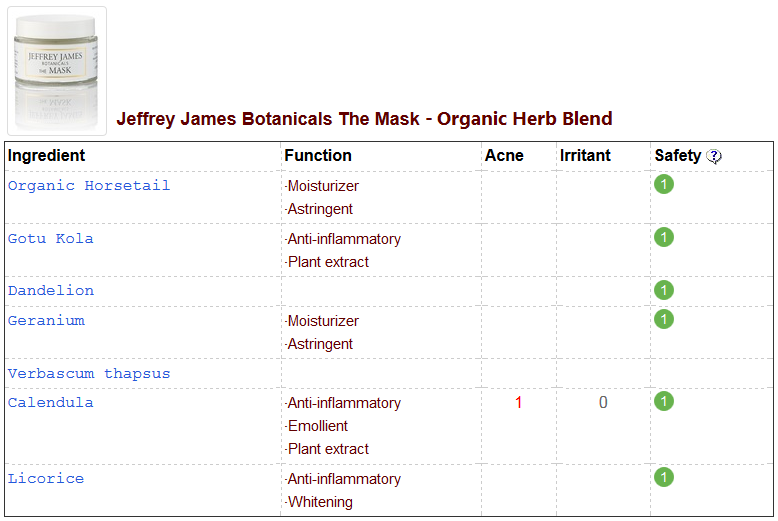 A 59ml jar of Jeffrey James Botanicals The Mask has a recommended retail price of US$42.00. It sells for a little less at iHerb. The Jeffrey James Botanicals range is available at the brand’s website as well as from various online stockists including iHerb. Jeffrey James Botanicals The Mask expires 12 months after opening. Presentation is once again simple but elegant. 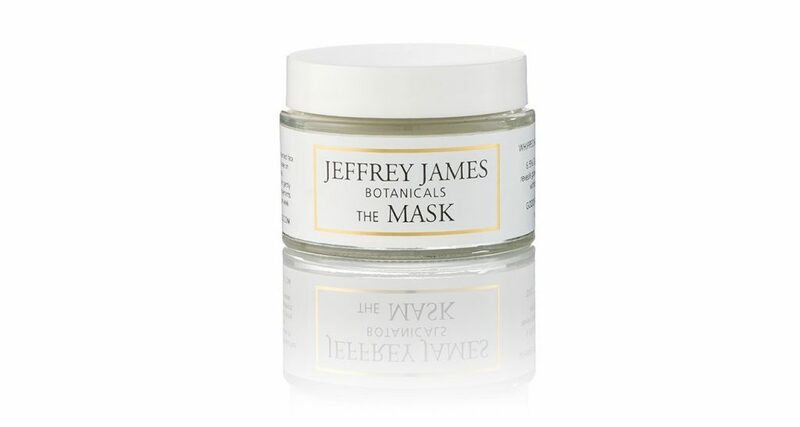 Jeffrey James Botanicals The Mask comes in a weighty but small clear glass jar suggesting it is not light sensitive. There is no spatula or protective inner cap included. I was a little heavy handed at first and still managed around 8 application from the 59ml jar. A thin film is all that is required thus the mask is more likely to stretch closer to 10-12 applications which brings the product cost to a reasonable AUD$3.30-4.00 (US$2.50-3.00) per mask (using the iHerb price). Upon opening the jar, an immediate distinctly sweet raspberry scent wafts through the air. It is quite delicious! The only additive in the formula that is exclusively for fragrance enhancement is that of the Natural Acai Berry. I assume the raspberry fibres contribute to the product smell as well. It is a scent that I enjoy and is no way irritating to me. Although I prefer fragrance free skincare, it should be noted that I am not sensitive to any added fragrance, natural or otherwise. The texture is light and fluffy without being sticky or tacky. Although it contains clay, it is not dense. The weight certainly reflects the whipped raspberry mud mask description. There is a good amount of glycolic acid in the formula as well as a few other AHAs which can be irritating to some, particularly those with sensitive skin or anyone new to acids. Such candidates are likely to feel a tingle on their skin which is a perfectly natural and normal reaction to AHAs and is simply an indicator that the product is penetrating the skin. An impaired barrier function may accentuate this sensation whereas increased sebum production or familiarity with acids may impede it. The tingling is a reflection of the low pH of the AHA clashing with that of the top most layer of the skin. Personally, I found this product very gentle and experienced no such sensation. To apply, a light cover is required which I prefer to brush on since the consistency permits it. It’s simply less messy than scooping out and applying with the fingers and also allows a more even distribution of the product. The mask dries with only the slightest tightening of the skin. There is no cracking or discomfort. It more or less dries clear with just a film remaining after around 10 minutes of wear time. I don’t leave clay masks on longer than required as they can have a drying effect because of their ability to draw out both impurities and facial oils. I like to use warm water to loosen the mask and massage it off to provide further exfoliation. It rinses cleanly for a refreshed finish. Upon removal, my face looks brighter and feels smoother, an immediate indicator of efficacy. Furthermore, there is no tightness. The abundance of fatty acids and humectants in the formula ensure it is not drying. I love that it provides multiple benefits in such a short period. This encourages frequent use and enjoyment as the time commitment is relatively short. Regarding negatives, I personally found none although I would recommend patch testing for those sensitive to (natural) fragrance, essential oils or acids. 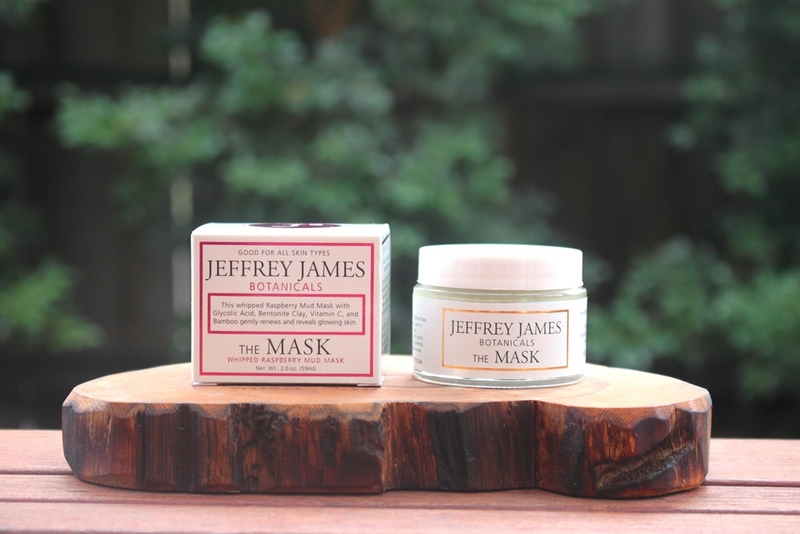 Jeffrey James Botanicals The Mask is an all natural product that does what it claims. What I love most is that it combines the effects of two masks in one. 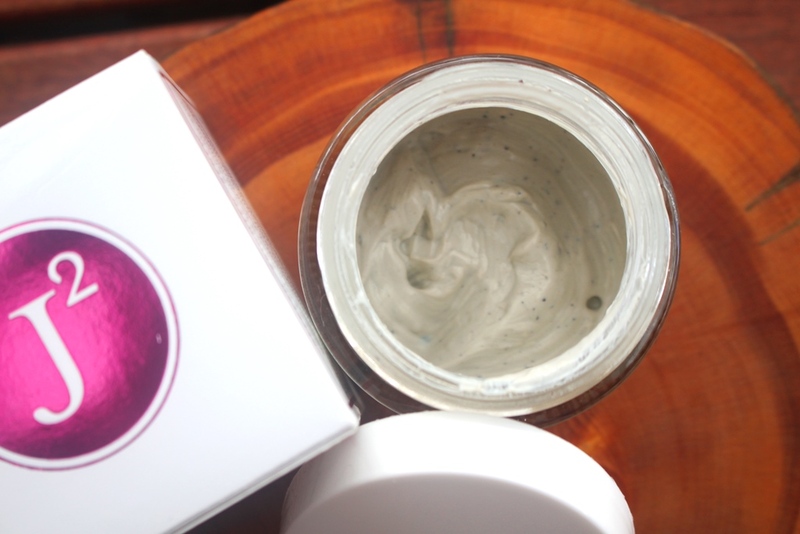 It is both a clay mask to detoxify pores and an exfoliant to sweep away dead cells. This double effect leaves the skin glowing and fresh.